Mr. Christopher J. Hayes is a native of Ettrick, VA. His music career began at a young age, while attending Oak Street A.M.E Zion Church, where he learned how to play hand bells, sing, and play piano. He then went on to learn how to play the Trombone in 7th grade, and the French Horn in 8th grade. As an 8th grader, he had the distinction of earning 1st chair for All District Band as a trombonist. Mr. Hayes then went on to Matoaca High School, where he continued to flourish as a musician. Earning such distinctions as All-District Band, Virginia Tech Honor Band, Semper Fidelis award, Music performance scholarships, and the John Phillip Sousa Award. Mr. Hayes then continued his musical journey when he enrolled in North Carolina Agricultural & Technical State University in the fall of 2002, to pursue a degree in Music Education. While at North Carolina A&T State University, Mr. Hayes quickly established himself as a top notch musician and bandsmen. He was selected as trombone section leader as a sophomore, and led the section for three seasons. During this time, he was honored as section leader of the year, top musician, and the trombone section received the section of the year award. As a member of the symphonic band, he served as principle trombonist for 3 years, and principal hornist for two years. He also served as a principal jazz trombonist and soloist. Mr. Hayes is also a classically trained trombonist, and put on a solo recital each year while he attended the university. He was awarded the Music Departments top performance honor in 2006 for placing 1st in a classical solo competition. Mr. Hayes was also selected to participate in the HBCU All-Star Band in 2006, and made the HBCU consortium Symphonic Band in 2006 & 2007. He received his Bachelor of Science in Music Education with honors in May of 2007. Upon graduating from college, Mr. Hayes quickly found a position as Director of Bands at Thomasville High School (NC)). While Director, Mr. Hayes established Thomasville as one of the premier bands in the state of North Carolina. Under his direction, the band won over one hundred and twenty 1st, 2nd, and 3rd place trophies including the 2008 1st Place AA National High Stepping Band Championship Trophy. The Thomasville band helped establish such NC staples as “front facing” drills and other marching techniques pioneered by Gary M. Bryant, as well as a big clean brass sound. After five years of service, Mr. Hayes accepted the position at Hillside High School (Durham, NC). While at Hillside, Mr. Hayes continued the Hillside Legacy of musical excellence. During the 2013 year, the band won two Grand Championship trophies, finished 1st Place in class 3A in the state, and 2nd Runner up Overall. In the same year, the band placed 2nd at the Viewer’s Choice BOTB, and Mr. Hayes was honored as Director of the year. Many of Mr. Hayes’ students have received scholarships and honors after graduating from his tutelage. 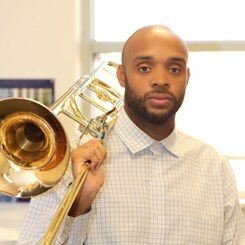 In February of 2015, Mr. Hayes took over leadership of The Great James B. Dudley High School Department of Bands succeeding the legendary Ricardo V. Reid Sr. As the current Director of Bands, Mr. Hayes seeks to continue the excellence and legacy of the program, and would like to lead the band to even higher levels of achievement and excellence. Currently, Mr. Hayes oversees all band operations and also serves as the Chief Arranger of the program. Mr. Hayes is a stickler for music fundamentals and diligently works to make sure that all of his students are musically literate and proficient. As Director of Bands, Mr. Hayes will also work to ensure that his students have a diverse musical experience to include; symphonic, jazz, and marching bad. Mr. Hayes, would also like to see at least 80% of his graduates yearly receive scholarships and honors from Colleges and University band programs. Mr. Hayes professional affiliations include, Kappa Kappa Psi, Kappa Delta Pi, North Carolina Music Educators Association, North Carolina Show Style Band Directors Association, and the HBCU Band Directors Consortium. Lastly, Mr. Hayes is currently pursuing his Masters in Music Education from UNC Greensboro. Request Lessons with Christopher J. Hayes today!